"Please, God. Make me a Yankee!" We’re back and we are greedier than ever with the latest idea to break the bank, blow all the austerity talk out the window and blow the baseballs out of Yankee Stadium with even more consistency here in 2018. I know it is out of the realm of possibilities fiscally, but I don’t worry myself with the financials much anymore, instead I worry about getting the best 25 players that I possibly can out on the field on any given night. 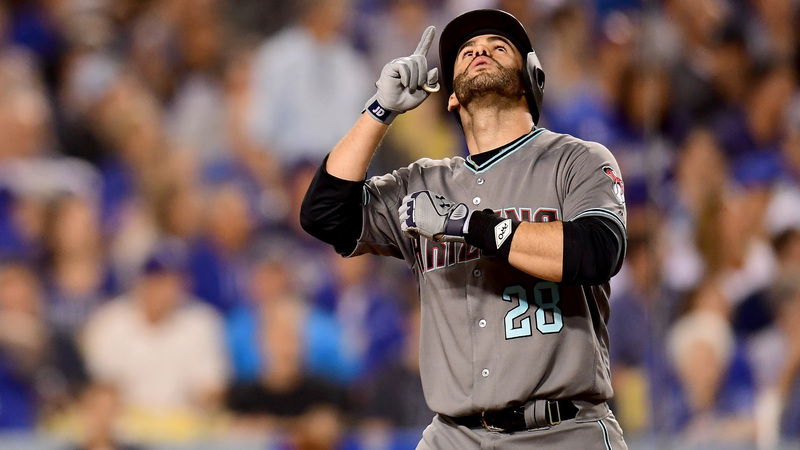 With that in mind it is time to get greedy once again and sign former Detroit Tigers and Arizona Diamondbacks outfielder JD Martinez. Yeah, I went there. Now earlier today in my free agent post where I outlined what free agents I thought the Yankees should at least have discussions with I alluded to the fact that I was happy with keeping the designated hitter position a revolving door for the Yankees outfielders to use for half-days off and here is the reason. Adding another outfielder is more of a luxury than a need at this point but New York added a $13 million DH last offseason in Matt Holliday and got little to show for it in return. Could you imagine if the Yankees were to add a bat like JD Martinez’s who could play in the outfield and DH a few days a week to keep everyone fresh, healthy and productive? The hell with the Bronx Bombers and Murderer’s Row, that would be downright unfair. Now I know this is a bold statement and a bold request of the Yankees to sign possibly the best positional player on the free agent market in a year where the team is going to give austerity a try but hear me out. Giving Martinez the security of a longer contract could conceivably keep the average annual value of the contract down while giving the team a leg up on the competition in terms of negotiations, because what player doesn’t want security and peace of mind? Martinez has possibly been the best kept secret in MLB over the past couple of seasons which is a scary thought since Martinez was a 4.1 WAR player in 2017 with Detroit and the Arizona Diamondbacks. Martinez has eclipsed 20 home runs in each of the last four seasons including hitting 45 home runs in 2017 and 38 home runs in 2015, both inside extremely pitching-friendly ballparks. You can add 10-15 home runs to that total in the Bronx assuming he is healthy and has a healthy Aaron Judge, Gary Sanchez, Didi Gregorius etc. behind him protecting him in the lineup. Again, downright unfair. Martinez just turned 30-years old recently and is in the middle of his prime, so I would feel comfortable giving him a six-year deal with an option for a seventh year if that were a sticking point in the negotiations. Martinez is good in the field, great with the bat and I think he would be an incredible addition to the team. Whether Hal Steinbrenner opens up the wallet strings or not is one thing, but I think the Yankees should make the move if the money allows. Martinez could be the Paul O’Neill to the 2018 dynasty that O’Neill was to that 1996 team. Just get it done.